Imagine a robot vacuum that not only remembers a home’s floor plan and cleans specific rooms by name – but also automatically empties itself. 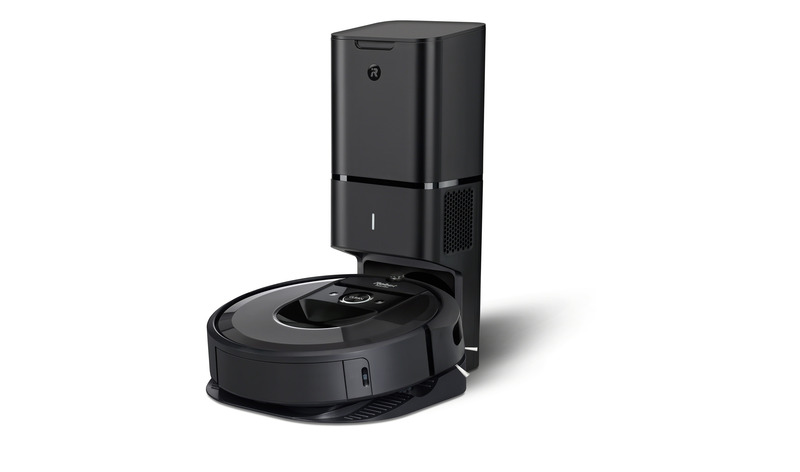 iRobot Corp. (NASDAQ: IRBT), the leader in consumer robots, today announced the Roomba® i7+ robot vacuum with Clean Base™ Automatic Dirt Disposal. The Roomba i7+ brings a new level of intelligence and automation to robotic vacuum cleaners with the ability to learn, map and adapt to a home’s floor plan. Introducing Imprint™ Smart Mapping, the Roomba i7+ remembers multiple floor plans and room names so users can customize cleaning jobs and direct the robot to clean specific rooms by voice1 or via the iRobot HOME App. When the Roomba i7+ robot vacuum is finished cleaning, it empties its own dust bin into the Clean Base™, which holds 30 bins of dirt, allowing customers to forget about vacuuming for weeks at a time. The Roomba i7+ works with Alexa™ enabled devices and the Google Assistant, and is the only robot vacuum that lets users clean specific rooms by name with a voice command1. For example, just say, “Alexa, ask Roomba to clean my kitchen,” or “Hey Google, clean the living room,” and the Roomba i7+ will efficiently find its way to the appropriate room to clean. Once finished, the robot will return to its base to charge and automatically empty its contents when paired with the Clean Base™ Automatic Dirt Disposal. Roomba i7+ and e5 robot vacuum photos, videos and information can be found at: http://media.irobot.com/media-kits. In addition to joining the Foundation, many of the new members have joined Linux Foundation projects like the Academy Software Foundation, Akraino Edge Stack, Automotive Grade Linux, Cloud Native Computing Foundation, EdgeX Foundry, Hyperledger, LF Deep Learning, and LF Networking. For a full list of members, visit https://www.linuxfoundation.org/membership/members/. Aljabr provides a modern approach to reusable data processing and computation pipelines for a cloud native world. Animal Logic is recognized as one of the world’s leading independent creative digital studios. Antmicro is an embedded technology company which combines latest software and hardware technologies to create advanced products for its customers. ARRIS provides solutions and services to transform the future of connectivity. Atomist Inc. is a platform purpose-built for delivering modern cloud native applications. Banzai Cloud is simplifying the transition to microservices on Kubernetes. Basking Automation GmbH is building automation for office buildings of the digital age. Bezant Foundation Ltd is a decentralized payment platform enabling the creation of robust applications. Blue Sky Studios is a computer animation film studio. BlueData Inc makes it easier, faster, and more cost-effective to deploy big data analytics. BoxBoat Technologies helps global companies develop, integrate, and deploy applications faster with emerging technologies. ChainDigit helps with enterprise blockchain consulting. Chainyard turns blockchain into business results. China Securities Credit Investments is a credit management financial institution. Cockroach Labs is a cloud native SQL database for building global, scalable cloud services that survive disasters. Coil Technologies, Inc. makes it easier to earn money on the web. Deutsche Telekom AG is one of the world’s leading integrated telecommunications companies. DigiCert simplifies PKI-based security solutions at any scale, so you can focus on growing your business. DoIT International provides professional services and software for startups. Eden Partners is a new generation blockchain technology with scalability and safety. ELASTX delivers truly automated cloud services. Epic Games, Inc. brings high-fidelity, interactive experiences to PC, console, mobile, AR, VR and the Web. Federal Express is a multinational courier delivery services company. FinFabrik empowers people and businesses to access investment opportunity, take sound decisions and enjoy the experience of building wealth. InfraCloud Technologies helps organizations build scalable products and modernize their applications using cloud native principles and machine learning. Intain Fintech Pte Ltd combines the powers of AI and blockchain. Kumina B.V. designs, builds, operates and supports IT infrastructures that help companies thrive online, excelling at Kubernetes and cloud solutions. Matrix I.T CloudZone Ltd helps grow businesses by adopting the most advanced cloud technologies at a minimal cost. MYCOM OSI provides solutions for performance management, service quality management, fault management, analytics, and automation. NXM Technologies Inc is a blockchain IoT security company developing technology that enables smart devices everywhere to operate and communicate with each other automatically and securely without human intervention. Prophetstor is a leading AIOps platform for modern IT environments. Puppet provides modern automation delivery and operation of software across its entire lifecycle – simply, securely and at scale. R&D China Information Technology Co. Ltd. is a cloud solution provider. Radisys enables communications service providers to drive disruption with new open architecture business models. Scality delivers web-scale storage that powers digital businesses. Scalyr aggregates server logs and metrics into a centralized system in real time. Sensu, Inc. empowers businesses to automate their monitoring workflow and gain deep visibility into their infrastructure, applications and operations. SIA Exon LV develops blockchain solutions, IoT services, platforms and applications. Spireon, Inc. allows industries to manage their fleet in real-time, with business critical data on a single, easy-to-use dashboard. SysEleven GmbH is a leading managed hosting provider in Germany. The Walt Disney Studios brings quality movies, music and stage plays to consumers throughout the world. Uchida Tsusho is an information system development business. Walimai Zhejiang Information Technology’s sophisticated and banking level security enables consumers to verify the authenticity of products with ease. WaveMaker Inc helps build, pivot and scale applications twice as fast and at half the cost. Weta Digital Limited is one of the world’s premier visual effects companies. Windmill Enterprise delivers trusted blockchain solutions that allow enterprises to incorporate decentralized blockchain security features into their existing infrastructure. I-SENSE Group of ICCS addresses the evolving connectivity needs of embedded devices including mobility communication services, intelligent transport systems, environmental monitoring, applications for next generation emergency services and infrastructure monitoring for foundation of future smart cities. OpenAirInterface Software Alliance (OSA) is a non-profit consortium fostering a community of industrial as well as research contributors for open source software. Open Sourcing Mental Illness LTD is a non-profit corporation dedicated to raising awareness, educating, and providing resources to support mental wellness in the tech an open source communities. Vanderbilt University is a private research university offering a full range of undergraduate, graduate and professional degrees. Brazilian soccer powerhouse CR Flamengo signs an agreement with Israeli Tech company Physimax to utilize their system that provides Objective MSK (musculoskeletal) Snapshots for athletes, to help them improve performance and stay away from injuries. The partnership with Physimax, first of its kind in South America, is part of the club’s strategic goal to create the ‘ideal’ soccer player using innovative technology in movement pattern analytics. CR Flamengo uses Physimax technology to get MSK insights not only for its first team players, but also for the elite prospects of the club’s academy and track them over time as they become professional. Physimax which has been successfully used by elite athletes in the NBA, US Military and top NCAA D-1 athletic programs demonstrating an impact in injury rates and expenditure, is now used for the first time in South America. The Linux Foundation, the nonprofit organization enabling mass innovation through open source, today released a free eBook entitled Enterprise Open Source: A Practical Introduction. The book is written for software engineering executives, development managers, compliance experts, senior engineers and others involved in enterprise open source activities. The book outlines specific actions enterprises can take to accelerate open source efforts, based on the experience of hundreds of companies spanning more than two decades of professional, enterprise open source. This free resource is available for download now at https://www.linuxfoundation.org/publications/2018/08/enterprise-open-source-practical-introduction/.